Tata Starbucks Private Limited has introduced the Starbucks® India mobile app across the country, giving customers a fast and convenient way to pay for in-store purchases and earn Stars through the loyalty program using their mobile device. The move makes Tata Starbucks the first major retailer in India to offer customers a mobile payment option linked to a loyalty program and further expands Starbucks robust global digital ecosystem. Available for download on iPhone® and Android™ devices, the Starbucks® India mobile app offers customers the convenience of paying for their favorite Starbucks beverages with their mobile device by scanning a barcode linked to their registered Starbucks Card. Customers can also register multiple Starbucks Cards onto their account within the mobile app. In addition to mobile payment, the app allows customers to register for the My Starbucks Rewards program, earn Stars, track and redeem their rewards, manage their accounts, and gain access to new product information and promotions, all within one convenient app. At Starbucks, the digital experience is a foundational part of a seamless customer experience. Starbucks debuted the My Starbucks Rewards loyalty program in India in 2014and now has more than 250,000 members who are earning Stars and receiving benefits through the program. 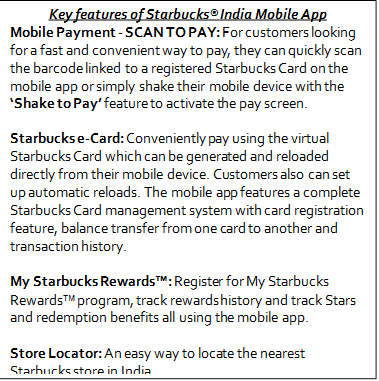 The Starbucks® India mobile app builds on a rapidly-expanding portfolio of technological innovations at Starbucks. Most recently, the company unveiled an innovative conversational ordering system in the U.S. called “My Starbucks Barista” and pioneered a new social gifting feature on WeChat, China’s leading mobile social communications service. 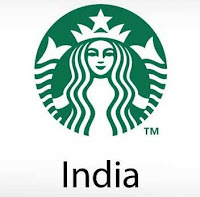 Starbucks entered the Indian market in October 2012 through a 50:50 Joint Venture with Tata Global Beverages and currently operates 91 stores in India across Mumbai, Delhi NCR, Hyderabad, Chennai, Bengaluru and Pune, through a network of over 1200 passionate partners (employees). 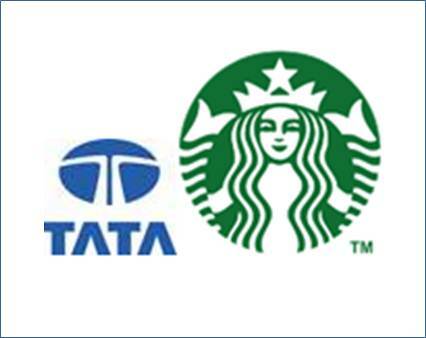 Starbucks stores are operated by the joint venture, Tata Starbucks Private Limited, and branded as Starbucks Coffee - “A Tata Alliance."